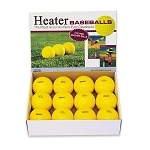 Many pitching machines are designed to use balls made specifically for them; therefore, you should use the same brand balls as the pitching machine you have purchased. There are a variety of balls for pitching machines and each has its purpose. 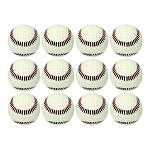 Below, you will see the different pitching machine balls that we offer. Be sure to scroll below the product listing to find out more about the differences in pitching machine ball types and how they affect your practice. 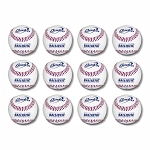 Before deciding which pitching machine balls will be best for your practice sessions, please visit the Choosing Pitching Machine Balls article in the Resource Articles section of our website where you will find information on the different types of pitching machine balls and why you might want to use one kind over another. 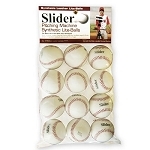 Although many of the pitching machines sold here technically can pitch real baseballs and softballs, you should only use each manufacturer's brand of baseballs and softballs with their machines. 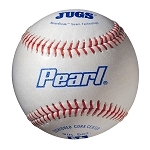 Regulation balls have seams that are raised higher than those on the specially designed manufacturer pitching machine balls. Those raised seams can degrade the wheels inside of pitching machines very quickly. 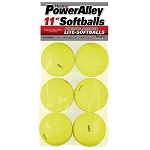 Additionally, real baseballs and softballs are made with strings and glue and the pressure of the wheels inside of a pitching machine will cause a regulation ball to go soft very quickly because of the extra pressure exerted on them. Pitching machines may also tear the covers off of regulation baseballs and softballs - especially cheap ones. The specially made dimpled pitching machine balls pitch far more accurately than regulation balls do, as well. 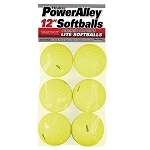 Please be sure to check out the Approved Balls tab in the full product description of each pitching machine to see what ball(s) it is specifically made to be used with. And, if you have a question, please contact us; we're here to help! Will Pitching Machine Balls Dent My Composite or Aluminum Bat? There are a lot of overplayed myths when it comes to pitching machine balls and aluminum or composite bats. 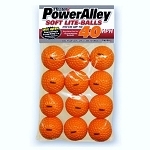 Those misconceptions arise from public batting cages where balls are left outside in the rain. 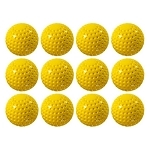 Those public batting cage balls get harder and heavier than regulation balls after becoming water-logged. Harder, heavier balls can definitely cause damage to a bat! 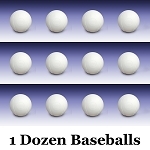 Pitching machine balls, whether they are dimpled balls or leather pitching machine balls, are no heavier and no harder than regulation balls if they have not been left out in the rain and because of that, they cannot possibly do more damage to a bat than a regular baseball or softball. Keep the balls out of the rain and your bat will be just fine.